Our company is backed by highly advanced infrastructure facility. We have established it over a vast area of land at our premises. To keep place with the ongoing market trends, we have installed all the modern machines and tools required for the production process of the offered array of products. For hassle free execution of all the operations we have separated our facility into various functional and productive units. Each and every unit is handled by our experienced team members. Our infrastructure facility has manufacturing unit, quality testing unit, warehouse and packaging unit and R & D unit. With the help of our infrastructure facility, we have been able to deliver the offered products in requested period of time as it’s able to produce the offered products at a best production rate. We are offering a wide range of Carpets & Rugs to our valued customers as per their requirements and needs. Our products are made from superior quality basic material in compliance with the industry approved standards. We have a broad distribution network across the world to deliver our products within limited frame of time. 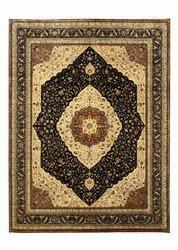 We are among the best resource of the market to avail the Carpets & Rugs products. We have a huge client across the market for our quality assures product range. We are supported by a team of hardworking and well qualified work force who stringently work to bring perfection in each produced range. They strictly examine and check all the offered products starting from the initial phase of production till the final delivery to the clients. Further, they ensure that all the offered products are manufactured in compliance with the globally accepted norms laid by the market. We have in our team, production experts, and quality inspectors, sales and marketing executives, warehousing agents and R&D experts. With the help of these employees, we have been able to cater the diverse requirements of our clients effectively as per their precise demands.